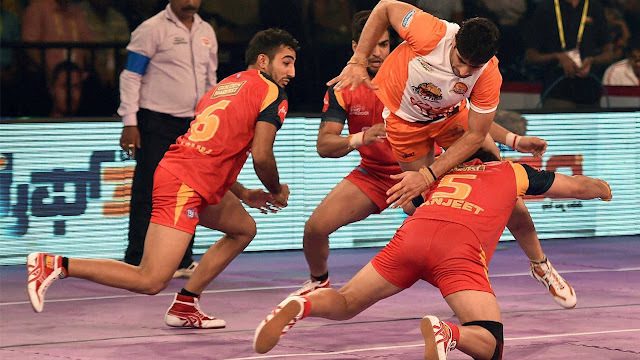 In Match 71 of the Pro Kabaddi League 2017 Season 5 of the Inter Zone challenge week, it was the Bengaluru Bulls that stood victorious at the end of the match. The Bulls have finally won a match after six consecutive losses as they hand Puneri Paltan their third loss of the season so far. Both teams played on their defensive side and it was the Bulls that prevailed victorious. Bengaluru Bulls created 15 tackle points that led the Bangalore side to finally smile at the end of a hard day. The Perfect Raider of the Match is presented to Ajay Kumar from Bengaluru Bulls with 3 raid points. The Player of the Match is presented to Sunil Jaipal of Bengaluru Bulls with 4 tackle points. The Do or Die player of the match is presented to Rohit Kumar of Bengaluru Bulls.